The impact of the likely cause could be “severe” and “irreversible”. 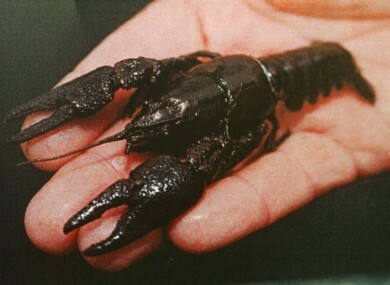 File photo of a white-clawed crayfish. THE NATIONAL PARKS and Wildlife Service (NPWS) is investigating the cause of death of large numbers of freshwater crayfish in Co Cavan. The group is working with Inland Fisheries Ireland (IFI) to find out why the kill occurred. More than 600 dead white-clawed crayfish were found along a short stretch of the Bruskey River near Ballinagh. Fish and other freshwater animals were not affected. A statement released by the Department of Arts, Heritage and the Gaeltacht, which runs the NPWS, said preliminary results from DNA analysis indicate the cause of the kill is crayfish plague, a water-borne disease. Investigations are being carried out to establish how the disease got to the Bruskey River and whether it has spread from the initial area of infection. It appears that either the disease was accidentally introduced on contaminated equipment such as wet fishing gear or boots or boats used recently in affected waters in the UK or elsewhere. Alternatively, a non-native species may have been illegally introduced to the area and have passed the disease to the white-clawed crayfish. The department said if the disease outbreak was accidentally introduced on contaminated equipment containment may be possible. However, if non-native crayfish have been introduced then the disease is likely to become “established with severe and probably irreversible ecological impact on freshwater fauna and flora”. The NPWS and IFI are asking anglers and members of the public to take precautionary measures to help stop the spread of the disease. People are asked to alert the authorities to any reports of mass mortalities of crayfish, sightings of unusual crayfish (such as those with red claws or large than normal) and in particular to dry or disinfect boots or angling equipment before moving from one water to another. The department added that crayfish plague disease can be carried on wet equipment so all clothing and fishing gear that has been in freshwater must be treated with a disinfectant and then completely dried before moving to another area. This will avoid the accidental spread of the disease to other areas. The white-clawed crayfish is the only freshwater crayfish species found in Ireland and is present in lakes, rivers and streams. The department said the species has been “decimated” in Europe by the impact of crayfish plague, which spread to the continent with the introduction of the North American species of the fish. Until now, Ireland has been considered free of the disease and is the only European country without any established non-native crayfish species. Many American crayfish species are resistant to the plague. Email “Investigation launched after 600 dead crayfish are found in Cavan”. Feedback on “Investigation launched after 600 dead crayfish are found in Cavan”.